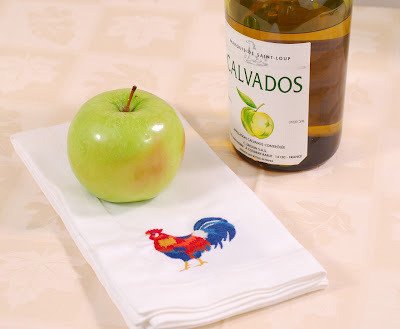 You come home from work, you're tired; a bag of chicken thighs in one hand and a bottle of Calvados in the other. What to do? Well here's another idea. 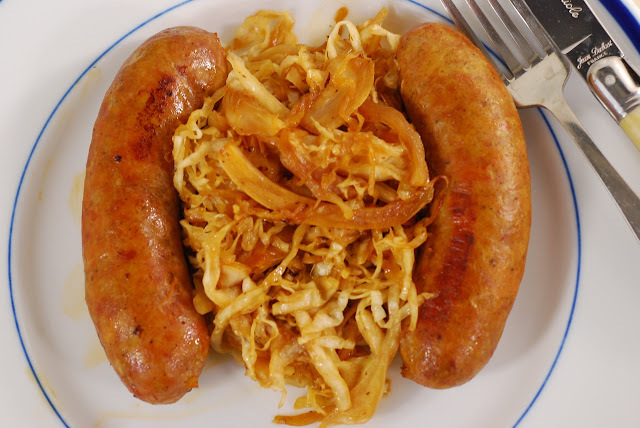 If you keep sausage casings handy (and they keep an extremely long time), you can quickly make these sausages. They are nice to keep in the freezer for a quick supper or weekend lunch, and best of all, they can be varied by the addition of dried fruits such as figs or prunes. Assemble grinder and gather ingredients. 1. Remove all skin and visible fat from the chicken thighs, and discard. There is enough fat in the meat to form a good sausage without the excess. I use clean poultry shears to snip off the fat. 2. Peel the apple, core and dice. 3. Using the coarse grinding plate, grind the chicken, fresh apple, dried apple, salt, pepper and other spices. 5. (optional) Stir in the Calvados, and any other fruit you have chosen to add. 6. Stuff into the prepared sausage casings. Form into 6-inch links. May be frozen for two months. 7. Cook links in a saute pan, covered, with a bit of oil over medium heat, until done. Remove to plate. 8. Add sauerkraut to the saute pan after removing the cooked sausages, and deglaze with 1/4 cup white wine and 1 T olive oil. Continue, occasionally stirring over high heat until liquid is evaporated. Serve. I'm impressed with this sausage! Looks amazing!